My earliest impressions of Cincinnati were (for better or worse) shaped by the call letters WKRP, a very buxom Loni Anderson, Les Nessman’s sought-after but nonexistent office walls, and Gary Sandy’s impossibly coiffed feathered hairstyle. That hardly seemed a proper representation, so, decades later, when I found myself in the “Queen City,” I headed straight to the Cincinnati History Museum to learn more about one of the largest metropolitan areas in Ohio. Circular bands of color grace the arch and the rotunda. Standing 106 feet high and 180 feet wide, the 10-story half dome of Cincinnati Union Terminal was completed in 1933 as a passenger railroad station built in the finest Art Deco design of the time for seven different rail lines. But it was a little late to the game — rail travel was already peaking, and after World War II, it began its rapid demise. By 1972, the year the terminal closed, only two daily trains were stopping at the station that once handled 216 per day. Abandoned, then redeveloped as a short-lived mall, and abandoned once again, the terminal was spared from the wrecking ball in the 1980s, when plans to reinvent it as a museum center were finalized. Today, it hosts — among other attractions — the Museum of Natural History & Science, the Cincinnati Historical Society Library, a children’s museum, the Cincinnati Railroad Club, and a movie house. 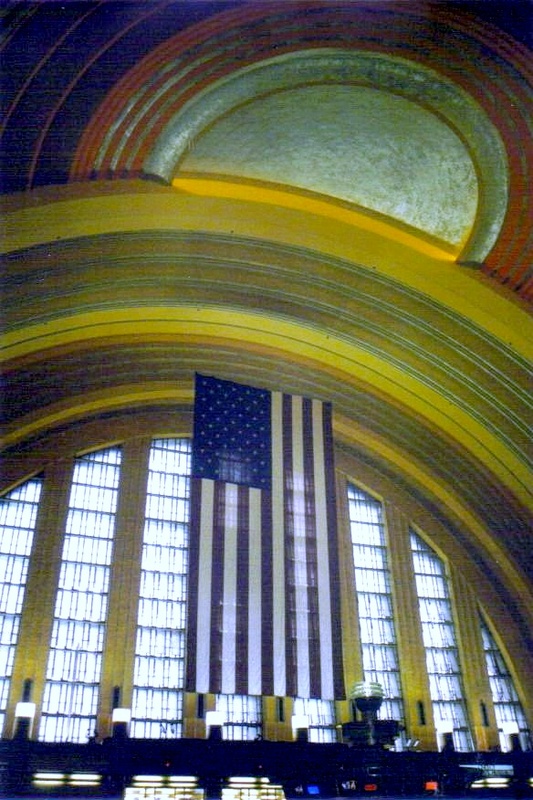 Entering the grand station, I passed under an enormous American flag into the main concourse. My eyes were immediately drawn upward, to the bands of yellow and orange around the arch and encircling the rotunda, and to the two massive mosaic murals curving around the rotunda. 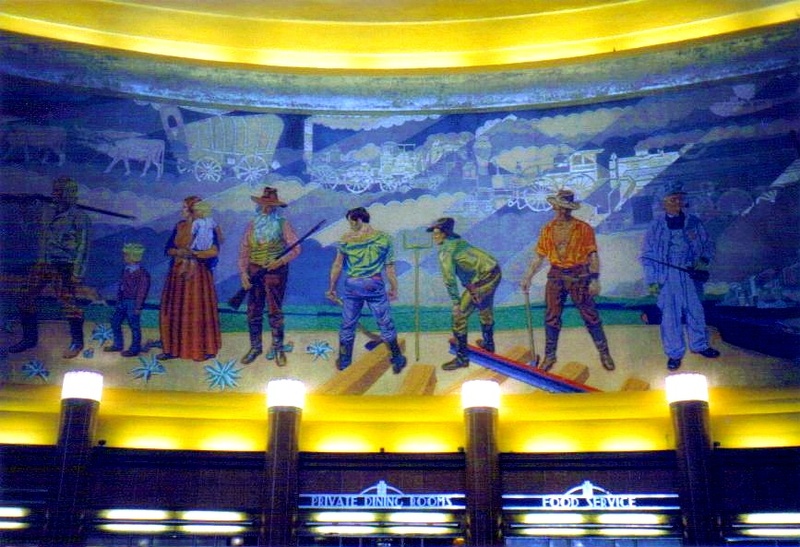 Each mural — an astounding 22 feet high and 110 feet long — portrays the city’s history with images of covered wagons, locomotives, and steamships, farmers and factory workers, all in rich, vibrant colors. One of the massive mosaic murals depicting the history of Cincinnati. The past here was practically tangible, and I could almost detect the presence of the thousands of passengers who used to move through this magnificent interior space every day, utilizing its former bookstore, toy store, clothing stores, barber shop, lounges, and, for long-distance travelers, bathtubs. I had to know more about this place, so I was excited to learn that tours of the building were available. I quickly signed up for one later in the day, leaving enough time to see the main reason I was here. I strolled under the arch that reads “Outgoing Taxis & Motor Coaches” in a classic Art Deco font and through the tunnel that used to funnel passengers to their transportation once they arrived here. Today, it leads directly into the Cincinnati History Museum. The permanent exhibitions are divided into four sections, each one bringing the city to life. “From Settlement to 1860,” for example, led me through street scenes and deposited me on board the Queen of the West, a replica of an 1850s steamboat that floats in its own pool. “Cincinnati Goes to War” presents the role of Cincinnatians both on the home front and fighting overseas. My favorite, “Cincinnati in Motion,” features the largest full-motion urban layout in the United States — fantastic scale models of the city in the 1940s, from the tallest edifices to the smallest fire hydrants, complete with running trains and streetcars, and building lights and streetlamps that turn on as night falls over the scene and fade as a new day dawns on a continuous loop of sunrise–sunset. 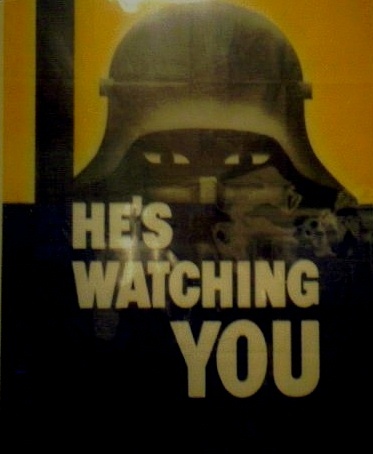 In the Cincinnati History Museum, a World War II propaganda poster made sure that everyone in Cincinnati felt unsafe from the enemy in the 1940s. As I left the museum with a greater appreciation of the city, my tour beckoned me. One of the first things the guide pointed out was the murals. They were created by the artist Winold Reiss, who, in an entirely unexpected validation of the small-world theory, was the same artist who created the mosaic murals lining the walls around the swimming pool in the building where I live in New York when it was a hotel in 1930. Delightful as this connection was, it wasn’t the solution to my lingering puzzle. Nor was the bird’s-eye view of the main concourse from the mezzanine level. Nor the streamlined offices for the railroad executives — think men in three-piece suits, female secretaries in stylish clothing, buzzing intercoms, leather furniture, and lots of cigarette smoke. With the tour nearly complete, my guide asked the group if anyone recognized this building from somewhere else. I was alone in my affirmative answer, and I could tell he was tickled by my inability to place it. I detected the glint of pleasure in his eyes as he was about to revel in the revelation of the secret: This half dome was the inspiration for the Hall of Justice in the Super Friends cartoon I used to watch religiously every Saturday morning as a child. He clearly appreciated the a-ha expression on my face. He smiled, I smiled, and the mystery was solved.